The report aims at estimating the market size and future growth potential of the market across different segments, such as content types, services, deployment types, end users, industry applications, and regions. The base year considered for the study is 2014, and the market size is estimated from 2015 to 2020. The enterprise information archiving ecosystem consists of enterprise information archiving solution providers, such as Microsoft Corporation, IBM Corporation, and EMC Corporation; system integrators, such as CGI Group and Stratalux; consultants; distributors; and resellers, such as Deloitte and Ernst & Young. 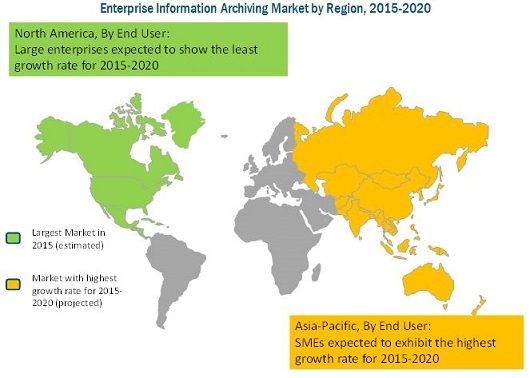 The enterprise information archiving market size is expected to grow from USD 4.31 Billion in 2015 to USD 7.55 Billion by 2020, at a Compound Annual Growth Rate (CAGR) of 11.8%. The rising need for data retention to meet the legal and corporate governance requirements and improve operational efficiency has enabled wider adoption of enterprise information archiving solutions among all industries. The global enterprise information archiving market has been segmented on the basis of content types, services, deployment types, end users, industry applications, and regions. The global market is segmented on the basis of regions into North America, Europe, Asia-Pacific (APAC), Middle East and Africa (MEA), and Latin America. The report analyzes the significance of enterprise information archiving in protecting an enterprise from legal inquiries related to disclosure of sensitive customer data or fraud against customers and at the same time achieving optimal business performance. In terms of industry applications, Banking, Financial Services, and Insurance (BFSI) is expected to grow significantly with the current advancements in technology and growth in the generation of real-time data in the sector. Life science and healthcare is expected to grow with the highest CAGR due to explosive growth in the electronic data and emerging communication channels triggering high priority concerns for security and privacy of Patient Health Information (PHI). Government and defense would be third in terms of growth rate during the forecast period. In terms of deployment type, cloud-based archiving is gaining traction in the enterprise information archiving market due to its low cost and scalability. However, data security issues with respect to the archival of data and lack of disaster recovery in hosted systems are restraining the growth of theenterprise information archiving market. North America, the U.S. and Canada in particular, is rapidly adopting enterprise information archiving solutions as there are substantial advancements in digital technologies in the region, leading to the introduction of new and stringent laws related to electronic data. The industries in the region need to adopt or upgrade their archiving solutions according to new technologies as well as laws. 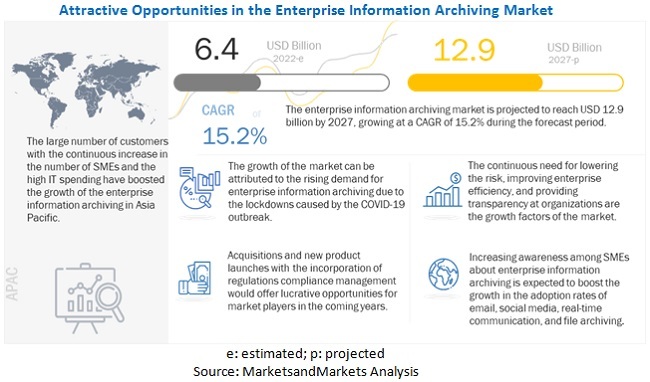 The enterprise information archiving market in APAC and Latin America are growing at a brisk pace and MEA is expected to grow steadily in the coming five years. Data security concerns with respect to external storage and lack of disaster recovery options in hosted storage facility are two major factors hindering the growth of enterprise information archiving market. To lead in the enterprise information archiving market, the major players have adopted the strategy of partnerships, which is evident from its highest share, i.e., 47%, of the total strategic developments in the market. Furthermore, new product launch is another key strategy followed by companies such as Microsoft Corporation, Google, IBM Corporation, Smarsh, and Barracuda Networks. This strategy accounted for a share of 42% of the total strategic developments in the market. The merger & acquisition strategy accounted for 11% of the total strategic developments of the top enterprise information archiving solution providers, such as IBM Corporation, Microsoft Corporation, Smarsh, and Global Relay Communications. 14.11 Global Relay Communications, Inc.